Thanks Apicio! I asked my mom about nami and tugui. She doesn't know the former but tugui, according to her looks like a cross between camote and gabi. Seems to tally with your description. By the way, I started a thread about edible insects in 'Elsewhere in Asia/Pacific'. 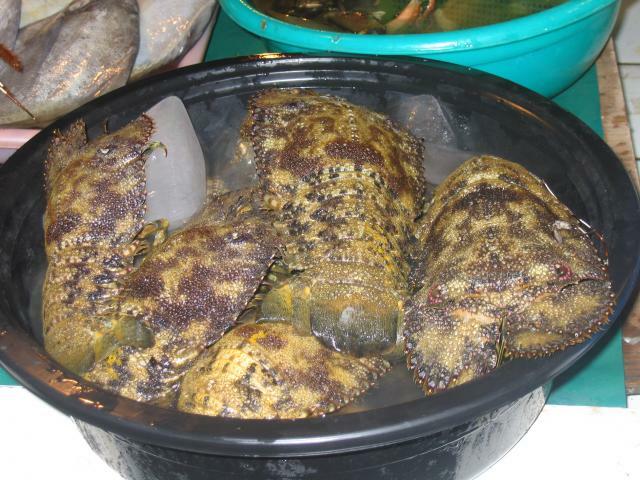 I thought of comparing species and cooking techniques across Southeast Asia but non-Southeast Asians are more than welcome to contribute to the discussion. My Mom still has a tendency to eat her corn-on-the-cob and her potatoes with both butter and sugar... that's regular baked potatoes, not just sweet potatoes or yams. Sugar on corn you say? Why, you made my mouth water for binatog (actually called pamitak in my hometown and kinulti in most of Nueva Ecija). I tried recreating it when I was living in the foothills of the Canadian Rockies but alas, failed. I used hominy corn that brought a completely alien taste to it. Nothing like our variety of glutinous maize (lagkitan) soaked overnight and simmered in water laced with wood ash for a few more hours until the plasticky hulls come off and the swollen kernels puff into chewy tender morsels. Eaten off banana leaf cones with grated coconut and seasoned with salt and sugar. Great on stormy days when the school announcements dispense you to show up. To PPPan, Yes I saw it that's why it bugs me not to remember any that I have eaten other than the ones that got through when I did not sift my flour. Sugar on corn you say? Why, you made my mouth water for binatog (actually called pamitak in my hometown and kinulti in most of Nueva Ecija). I tried recreating it when I was living in the foothills of the Canadian Rockies but alas, failed. I used hominy corn that brought a completely alien taste to it. Nothing like our variety of glutinous maize (lagkitan) soaked overnight and simmered in water laced with wood ash for a few more hours until the plasticky hulls come off and the swollen kernels puff into chewy tender morsels. Eaten off banana leaf cones with grated coconut and seasoned with salt and sugar. Interesting that you should mention this. There's a parallel discussion going on right now on the yahoogroups "Filipino Food Lovers". Is it the season for binatog right now? Hee, hee. My mother insists that it is Brazo de Mercedes (arm of Mercedes), because that's what her hoity toity Spanish-speaking aunt used to call it. She was one of those daughters of the rich, educated in a Spanish convent school (Assumption), and was taught her recipe by the nuns. Mother on the other hand was deeply suspicious of anything that has to do with nuns or priests or even worse, nuns with priests. All of us kind of tiptoed around her for fear of triggering her barrage of spanish invectives let out in fits of disgust and outrage. But this is way off topic. Still very much on topic though is distinctly Filipino desserts. Looks like Brazo de gitano and Brazo de la reyna are just two names for the same rolled sheets of sponge cake filled with custard, whipped cream or jam, a kind of dressy pionono. Its interesting to compare that this rolled shape suggests to the Spanish mind an upper arm while the French see in the same rolled shape a log (bûche). That’s likely why the Mexican cylindrical tamal is also called brazo whereas all the variations of rolled cakes (usually served at Christmas time) in France are all Bûches (de Noël). Now, in both Spain and France, but specially in France, the cake component can be joconde, génoise, biscuit or their chocolate versions but never a sheet of pure meringue as in our Braza Mercedez. The same freedom of choice goes for the filling, it can be whipped cream, butter cream, ganache, crème pâtissière, etc. but hardly ever a spreadable custard paste as in our Braza Mercedez. So I think we may now lay claim to Braza Mercedez too as one of our very own. Yes, Stef, it’s typhoon season di’nt you know. What Filipino site is that? Ah, (qu)(k)iltiang mais for us Kapampangans. Same root, kulti. I can't find the English term for it. Apicio, HELP! And yes, only our white lacatang mais will do. Same with cooking suam. Ah my dear PPPan, you have stumbled upon something on which the new world depended and which, much much later, indisputably demarcated the south from the north better than any Mason-Dixon line could. I’ll try explaining. It was easy enough for the Spaniards to bring us corn from America, after all, they ruled us for the most part through the Viceroy of Mexico where for more than a thousand years maize was the principal sustenance of the entire hemisphere. They must have brought us the cooking process too since our preparation of binatog is so cunningly similar to that of hominy or posole (in Mexico), from the husking down to the boiling in wood ash. The matching with grated coconut is strictly ours. 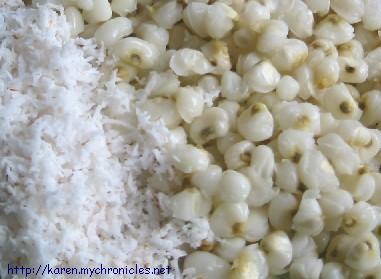 Now, hominy is eaten here (North, Central and South America) both whole (big hominy) or milled and cracked into different degrees of finess (small hominy). Both are eaten as accompaniment to anything and everything. The finer small hominy though is what is called “grits,” the quintessencial southern breakfast. But nothing beats binatog in my book. And yes, only our white lacatang mais will do. Same with cooking suam. Karen, is that the same cultivar as the one I know in Tagalog as lagkitan? And I'm thinking your suam is the same as our sinuam -- a soup similar to pesa, with ginger. It can be made with fish and veggies, and yes, with corn. Thanks for the historical notes, Apicio! I read similar details in researching about corn/maize. 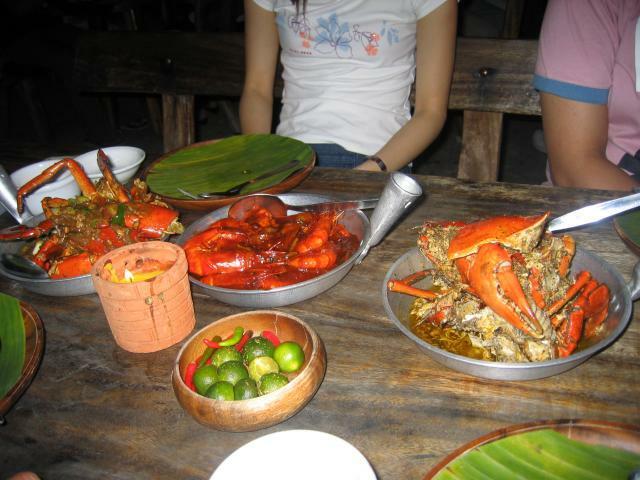 I'm due to post about binatog, suam and lelut mais (ginataang mais) on my blog. I think I had that binatog picture since last year. Still, I haven't found the English term for cooking in lye water. Hmmm... not pickled, not lye-preserved... but then my English culinary vocabulary is extremely limited. Stef, I think so. They're small, around 6 inches in length on the average and very moist. Suam mais is similar to cream of corn soup. Saute garlic and onion, shredded chicken then grated corn. Season with patis then add chilli leaves (dahon ng sili) five minutes before it's done. 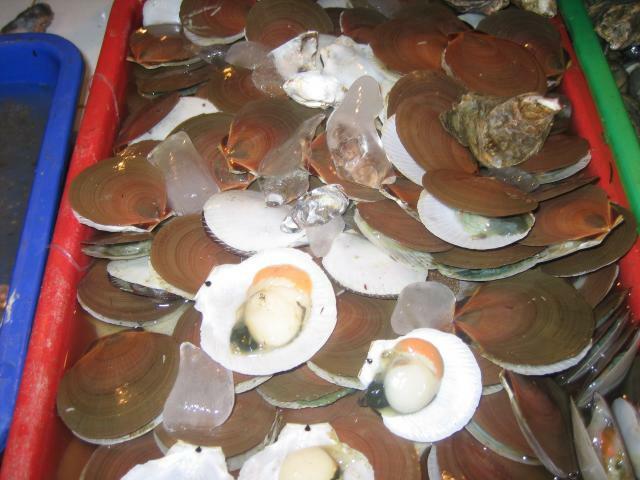 Clams can also be used instead of chicken. I've tried using golden sweet corn in the city, the soup turned out 'dry' - er, how do you say when the corn kernels don't end up creamy? Oh, someone has to do a comparison and contrast and I'm counting myself out. The corn you used failed to bind. Try adding a suspension of mochico in water. To alkalyze might be the word you are looking for. Ah, so to 'kulti' something is to alkalyse them? Hee hee! Sorry for the awkward translations. 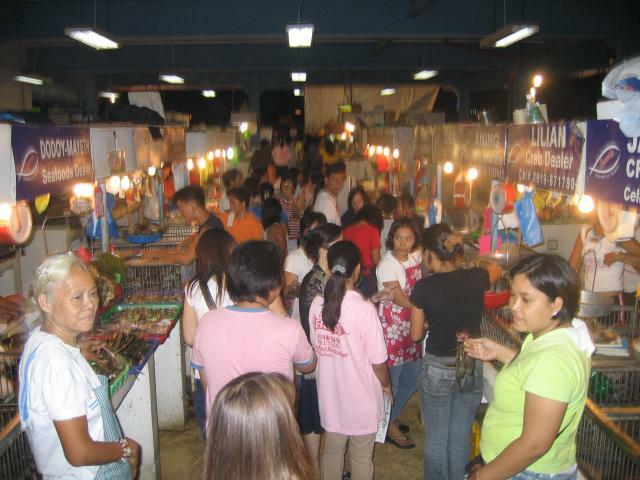 I've always been grasping for words when I try to explain what kinulti is, like binatog and our sweetened kundol candies. Probably yes because soaking kundol or rimas in apog before cooking them in syrup also involves the alkali in apog which is lime (calcium cabonate, I believe). The method though is to make kundol and rimas chunks firm up and not disintegrate. The photo of the Manila men is really interesting. I pick up vintage photos or prints of anything with Filipino connection like that wherever I may find them. By the way, I found this interesting, History of ‘Manilamen’ of New Orleans lost to ‘Katrina’. That's from yesterday's edition of the Philippine Daily Inquirer. Would anyone know if they really served 'paksiw' in New Orleans restaurants? Rimas reminds me of kamanse. Apparently when Captain Blight (remember the Mutiny on the Bounty?) gathered his breadfruit buddings for Jamaica, only the seedless variety was successfully transported. So I surmise from what my Jamaican acquaintance of long standing says. T’is a pity then that they never heard of seeded breadfruit back there. The more pity too that they have’nt learned to candy breadfruit either. By the way, he is a classic anti-example of what I observed in an old post, that Filipinos are not a chauvinistic bunch. I worked with this guy for sixteen years and tried as he did, he never succeeded in persuading me to go and visit his country. Why would I? His favorite refrain was, oh man if you only know how good our mangoes taste back there. I had to be diplomatic of course because I do know. Their mangoes are so full of husk eating them was like flossing your teeth. Of course it did not make it easy to have a Thai friend who confessed one day that you can find the best tropical fruits only in Thailand with a proviso “but I step aside for the Manila mangoes.” Or Mexican friends who rave and marvel at “mangos de Manila.” Another day the Jamaican fellow bragged to me “and man if you ever taste our banana you would’nt want to leave either.” So finally I asked what kind they grow. Countless varieties, he said, but the best is called “lakatan.” I rest my case. Oh Apicio, if you only knew. When I first came here I'd get almost tearful at supermarkets when I would see the colorless, flavorless Chiquita and sorely miss my lakatan, which I would eat -- as a teenager -- by the bunch. Through the years I've learned to resign myself to the fact that I won't ever have it here. A friend was raving to me about how organic bananas taste so much better than conventionally grown ones -- she has no idea. Lately I've been feeling hopeful though as I've heard of Jamaican lacatan being grown in Southern California and we may make it there next year. I can't wait! It seems like the Malay word lauk is equivalent. Soup in Malay is sup! That linked story on the Manilamen in Louisiana was really interesting. Thank you. The Malaysian language probably adopted the English word for soup just as most Filipino languages adopted sopas from Spanish but only for a particular kind of soup. If you look hard enough you will, in all likelyhood, find an indigenous Malaysian word for the generic idea of soup. 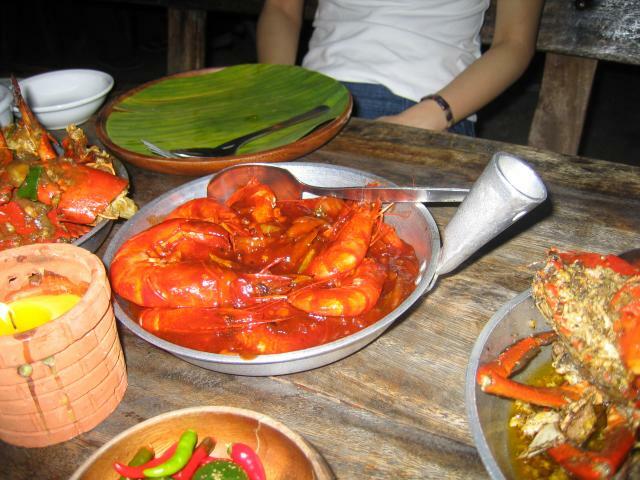 The manner of serving soup alone and separate at the start of the meal is alien to typical Southeast Asian meals. Instead, the liquid in which the main meal of vegetables and/or fish and meat has been cooked serves as our soup and is eaten along with the rest of the meal. This generic liquid is called sabaw in Filipino. A clear example is the Thai Tom Yoong Gung which they serve here (in America) as a soup although in Thailand it is actually a one-bowl accompaniment to rice that happen to have prawns, and vegetable in it. Even the Vietnamese Pho might just be a bowl of soup to you but to a Vietnamese it is a complete meal. The general language group of Malaysia, Indonesia and Filipino have many words in common at first glance but they have actually grown quite apart now due to separate development that these words are now just cognates and most of the time, just false cognates at that. Look at ubi, the Malaysian generic name for tubers. In Filipino ubi has come to apply only to one particular tuber, the purple yam from which our word for the colour purple was also derived. I do consider pho a soup, but it's definitely a complete meal; the bowl is very big! The Malay equivalent of sabaw is kuah. "Nama sejenis masakan seperti sup yang bisa dikombinasikan dengan bermacam-macam bahan." "The name of a type of cooked food [which is] like soup that can be combined with various types of things." Oddly enough, a search of "sup" turned up nothing in the Indonesian-English dictionary, which proves nothing other than its incompleteness. Thanks for the dictionary links Pan. I looked up gulai and it came up with curry. Now everyone with more than a passing interest in cooking should know that curry means one thing in the West and something else within India and its neighbors, including Thailand and the rest of Southeast Asia. In English, curry is applied to the dish flavoured with a combination of spices called masala in most of the Indian languages. In these languages and in that of the Philippines, Indonesia and probably, Malaysia kari (or kare) is a dish that is close to a Western stew or braise. Whereas gulay (or gule in PPPan’s Kapampangan) is a melange of vegetables that a self-respecting cook would be wise to take pains not to allow to stew. Nowadays, Filipinos call all vegetables gulay but to us older folks (or sticklers for correct usage), gulay is the dish, not the vegetables themselves. The vegetables are gugulayin, literally, the main ingredients that go into a gulay dish. To Stef, Yes I feel your pain. Did you notice too their plantain, did you ever imagine in your life substituting it for our saba? Btw, I told the Jamaican guy that lakatan is our priced indigenous banana variety. Our mangoes and bananas of course! Like Apicio, I just keep silent when others rhapsodise about their 'best' mangoes. I was oblivious to our the carabao/Manila cultivar's reputation till a Mexican colleague told me sometime back how the best ones in Mexico are called 'Manila' and then some African colleagues jokingly called me a fruit snob because I won't touch mangoes and bananas out of the Philippines (the refrain was: "how could you offer the Filipina inferior bananas? sub-standard mangoes?") . For me, I just wanted to explore fruits not commonly found in the Philippines, little did I know it was interpreted differently, hehehe! I was discussing general food topics with an Indonesian and she mentioned how ketan means sticky in Javanese, if I'm not mistaken. Perhaps that's close to our mother language and we just placed a prefix la- in lacatan from Spanish. My clue to this how we also call glutinous rice or malagkit lacatan. FYI: A link to the Austronesian language family tree. Most Southeast Asian languages are classified under the Malayo-Polynesian branch, hence the similarities. I hope it's alright i add this here, moderators pls move if deemed appropriate to a new or different thread. I took a weeklong trip to Manila in July this year. I had to go on business. I had some wonderful meals as well as some not so good. Unfortunately i didnt get pictures of every meal i had, but did get pics of my two favorite meals. 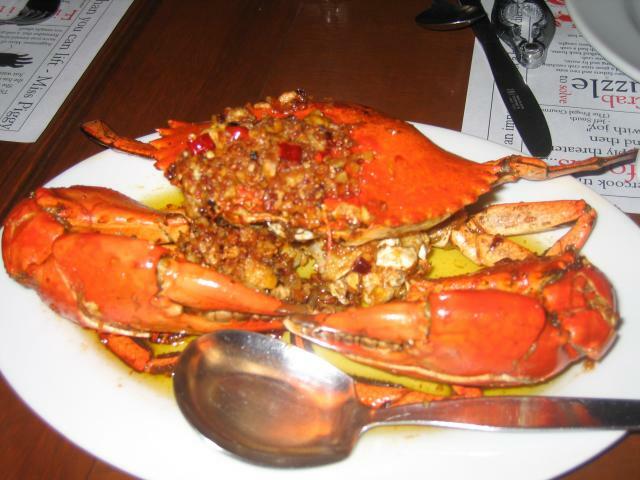 The first was at a place called the Red Crab i think. 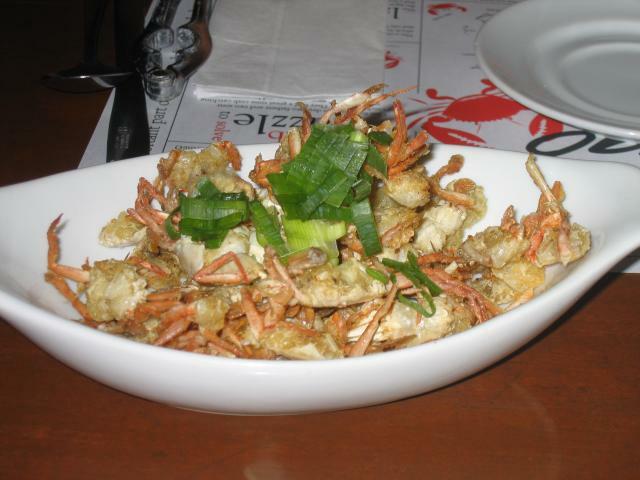 To start we had Crispy Crablets which were deep friend baby crabs with a dipping sauce of vinegar, chili, garlic. then we had Crispy Pata which unfortunately i didnt get a picture of but which is a deep fried pig's leg(more like bone) with not much meat, just the little crispy bits. This was quite good but a little chewy and as i was in the company of some business associates i was unsure of proper manners. 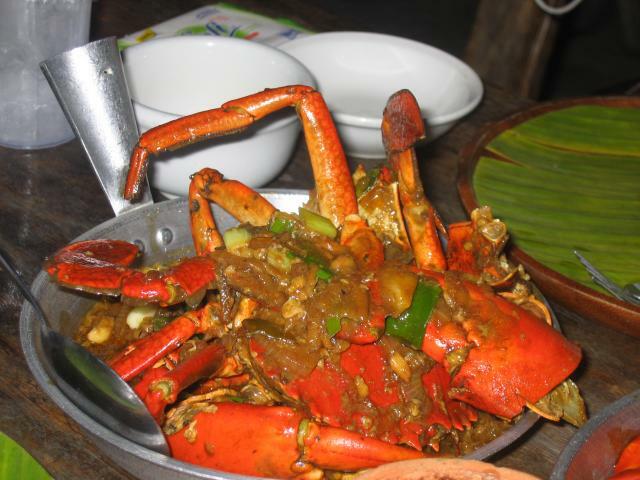 it turned out there were no worries as we soon got elbow deep into crab, but that was a little later. 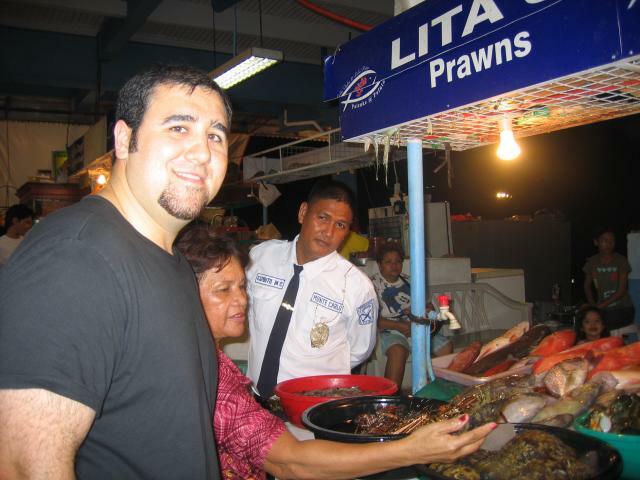 I took a trip to a seafood market called, of all things. the Home Depot(no relation to the home improvement store in the US). This was a really fun experience. You go into the seafood market, pick out and buy what you want(everything is pretty inexpensive) and then walk outside and sit down at a picnic table and small kitchens cook it for you. You choos how you want things cooked and they charge you by weight. Here's a picture of the crowded busy entrance. These looked interesting. I think they're called Slipper or Rock Lobsters. I was somewhat nervous because i'm used to eating my lobsters soon after they were living. 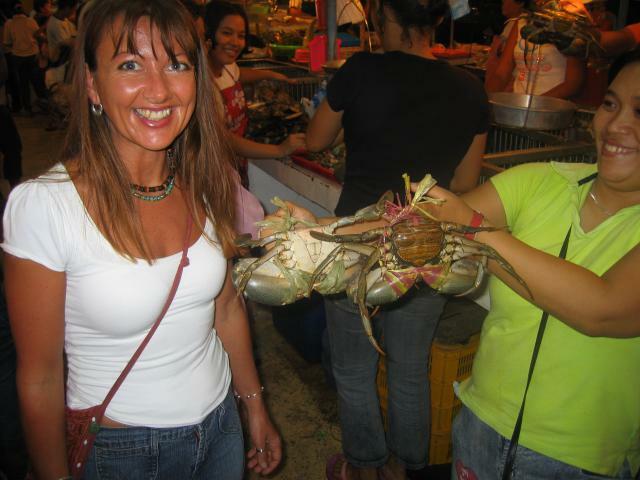 I swear, i'd never seen crabs this big...and yes, i bought and ate this one. This was flopping around during this picture. The guy cracked it on the head right after i shot it. 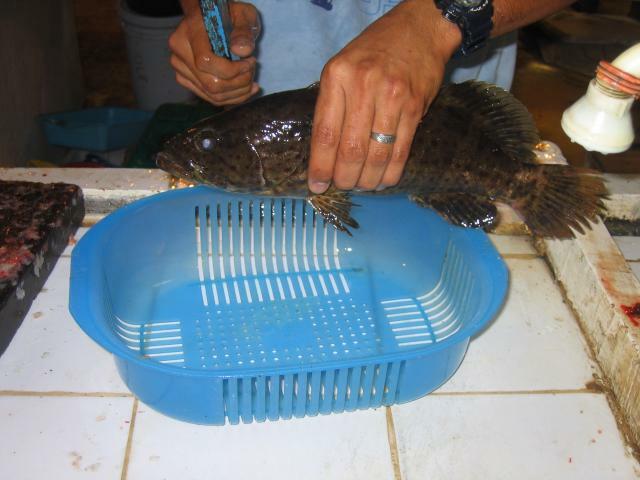 They said it was Green Grouper. Here are some scallops with roe. I was wondering about these because i could swear i read right here on Egullet that the roe is Very perishable and not even allowed to be harvested in the US because of it's short shelf life. Sweet and Sour Prawns. Wish i had gone butter and garlic or some other preparation with these as they were pretty gloppy. Couldn't tell you what preparation this was, but it was spicy. This is the green grouper steamed with scallions and ...soysauce? This was 2 small spiny? lobsters. i originally bought one of the slippers but when the chefs got the lobster they said they didn't like the way it smelled and went into the market and exchanged it for the 2 smaller ones. That's what i call good service. 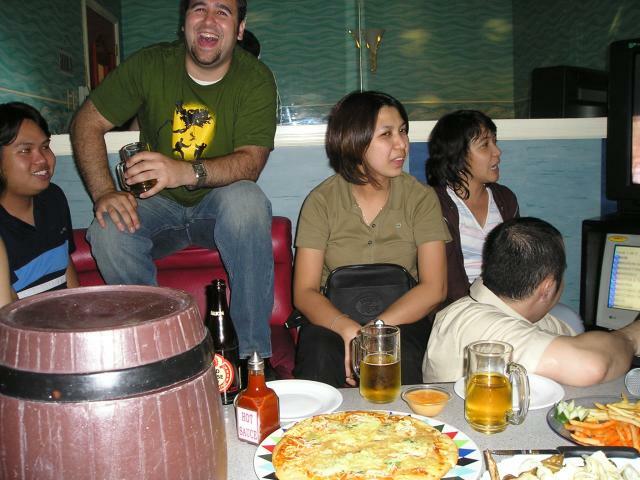 Completely irrelevant to food, but my phillipino coworkers took me out to video karaoke which was a great time. (of course i didn't sing though) Notice the mini keg sitting on the table. san miguel was a very enjoyable beer. There was a little food. think this was a pizza they gave us when we rented the private room. and that was a big bottle of hot sauce on the table. Wow, Brian, thanks so much for sharing all that with us!!! I am soo envious, especially about the Big Ole Crabs!!! The big ones here just aren't as flavorful IMHO. 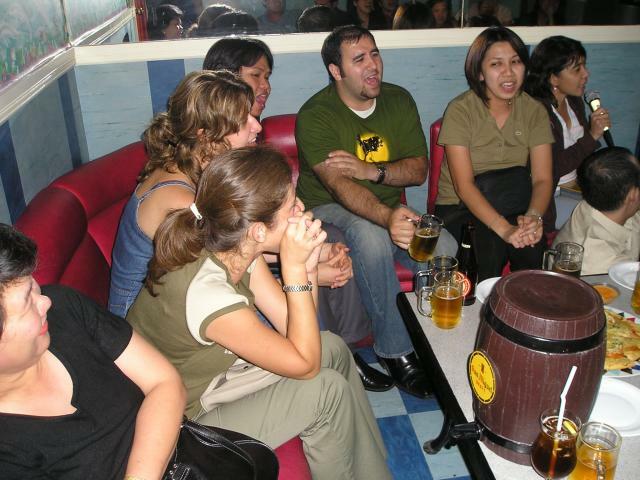 Question: your pic at the videoke bar -- was that a PC screen in front of that guy wearing the beige/yellow shirt? What was it for? Just curious, that's all. Oh, and it's "kalamansi", with an "n". The English name is Calamondin, Latin citrus mitis, syn. Citrus madurensis, Citrus microcarpa. aka kalamunding in Tagalog, aka Philippine lime and Chinese orange. Looks like you had a wonderful time. Anticipating your next post next time you go! Thank you for your marvellous post. 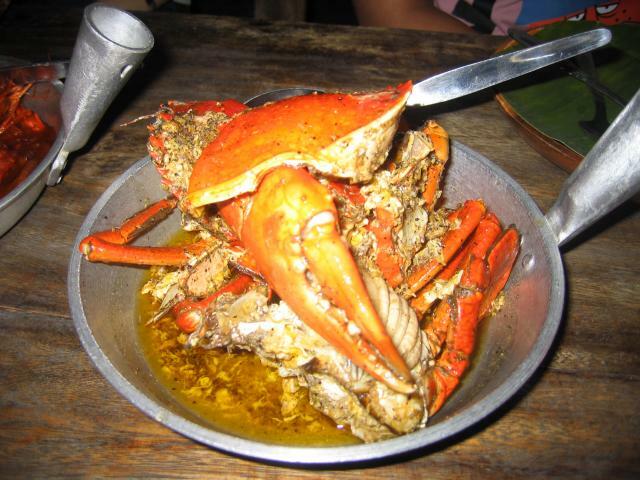 I'll tell you, you can only do justice to those dishes of seafood by wearing a bib and plunging into in with your bare hands, a skill that we Filipinos acquire through a lifetime of training and experience. Did you acquit yourself? What did you like best? This is too precious not to share with the rest of e-gullet, perhaps Soba-addict can suggest how to post it too in Adam Balic's seafood thread? The video screen was a part of the Video Karaoke. It had a list of available songs as well as a playlist with the next upcoming songs. Then a music video(not the original mtv version but sometimes what looked like a homemade version) would play on a 2nd screen. They had both american music as well as local music. The couple closest to the video sang a beautiful duet of Malay? music. My local friends kept trying to get me to drink a beer called the Red Horse which apparently packs a kick like a horse. needless to say it took a few of those before i actually picked up the mic. I also took a side trip to a beach while i was there. Don't know what the name is off the top of my head, but i'll find out. I took a few pics there too, but have not put them in imagegullet but will if there's some interest. It took 3hours by car over the mountains to get wherever it was. I didn't mention the intense heat and humidity. It really was like wearing a mask at times the humidity was so smothering. And when they tell you it's rainy season they really mean it. 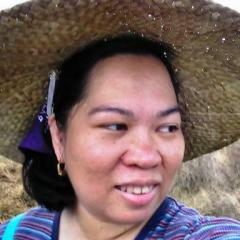 It poured rain almost every day, ususally at 1pm but sometimes only for as little as 20mins(but a downpour). I'm glad you liked it. I really did dig in after i loosened up a little. When we eat blueclaws on the jersey shore we let it all hang out and i figured crab eating was the same across the world. I didn't upload the aftermath of the meal, but maybe i will. eating outside in the extremely high heat and humidity and doing so with a meal that you have to work for to eat....well, let's just say there was plenty of sweating and not all was from the spice! I drank a few San Miguels to cool me down but man it was an experience! By far my favorite dishes were the butter and garlic grab and the steamed grouper. 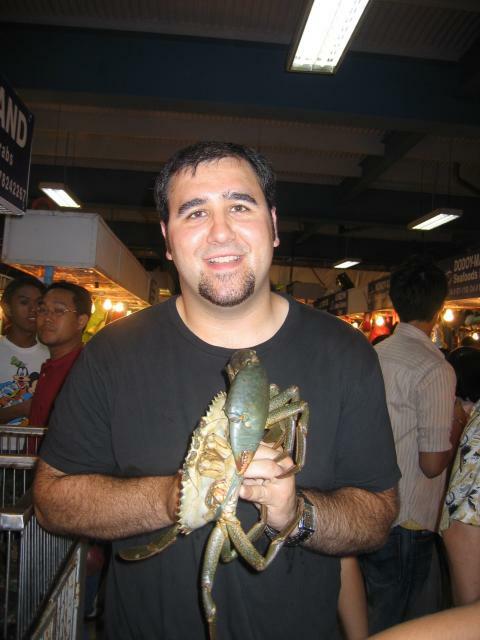 There were no crackers originally given to us and as the 'big guy'(i'm a big guy normally but in Manila i was a giant) my friends asked me to break up the big crabs. Luckily none of the points on the shell drew blood, but it wasn't an easy task. The grouper was just cooked through and absolutely delicious. I haven't eaten much steamed fish but it was a truly enjoyable preparation and you can't get much fresher than picking it out of a tank yourself. Also, the Crispy Crablets were amazing. I think they could be the ultimate bar snack. 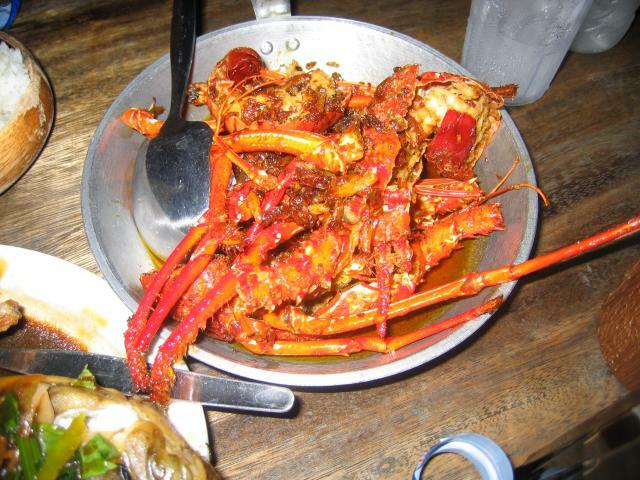 Give me a cold beer and a basket of fried baby crabs(with that great dip) and i'd be quite the happy guy. They had a great little crunch with that central core of crabby sweetness. Poots, I really enjoyed your post! Apicio, gulai aka kari in Malaysia is typically made with a rempah, which is a paste rather than an Indian-style dry masala, and Malay curries always (or virtually always, but to me this is definitional) contain coconut milk, never (same disclaimer) yogurt like north Indian curries (or whatever) do. To me, they are indeed curries, not stews, and I've never heard anyone distinguish between gulai and kari, but maybe I should run this past some people who live on the West Coast of the Malay Peninsula (I spent most of my time on the East Coast). What a mouth-watering post, Brian! You seem to have gone on a seafood extravaganza. 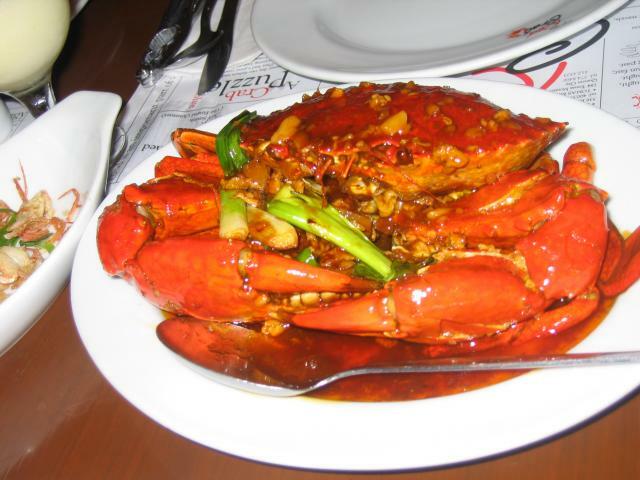 The restaurant's indeed called Red Crab. Here's the menu. It's relatively new but has gone on to expand successfully. If the beach was three hours away from Manila, that must've been in southern Luzon, in Batangas. Over the mountains could be Nasugbu. 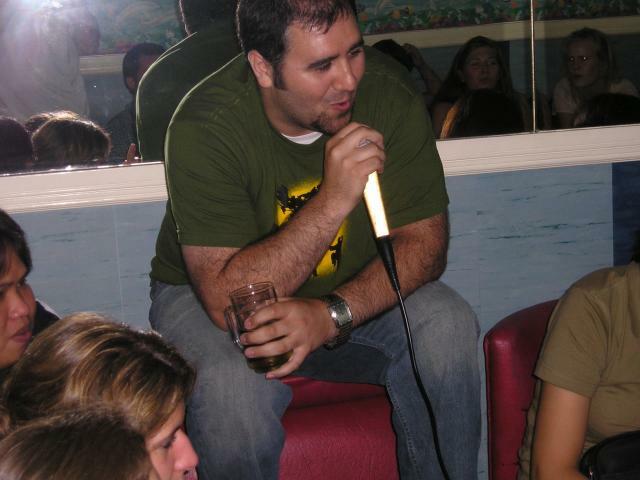 So you've been introduced to the Filipino past-time of singing in karaoke bars. I haven't been to a formal bar like the one you went to but in overnight seminars and workshops that I've gone to, chances are one room would be converted into a karaoke joint after dinner. I'm glad you enjoyed your stay in the Philippines. Alert us next time you go. Perhaps we can draw up a menu for you. The English name is Calamondin, Latin Citrus mitis, syn. 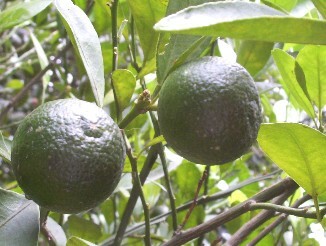 Citrus madurensis, Citrus microcarpa. 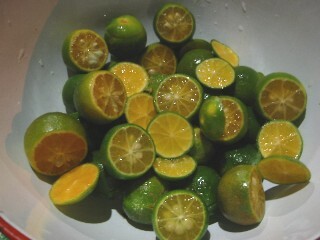 aka kalamunding in Tagalog, aka Philippine lime and Chinese orange. After Stef's exposition on kalamansi names, I thought it deserves to be seen up close and personal, tee hee! Actually, I've seen a lot of questions on how it looks like on other threads I thought I'd post it here. Ripe kalamansi: for juices, marinades, sauces, dips, dressings, etc. Apicio, gulai aka kari in Malaysia ... and I've never heard anyone distinguish between gulai and kari. So they are indeed synonyms in Malaysian then. You see I am trying to challenge in my modest way visitors and posters to this thread to be more informed about our own cuisines because Western regard of it can sometimes result in absurd generalisations. Like the previously mentioned term “curry” that summarily encapsulated the vast diversity of Indian regional cuisines in a catch-all term that is hardly ever accurate nor appreciative of its subtleties. Same with the terms soup and viand that superimposed a terminology and concept that’s foreign to a rice-eating culture. 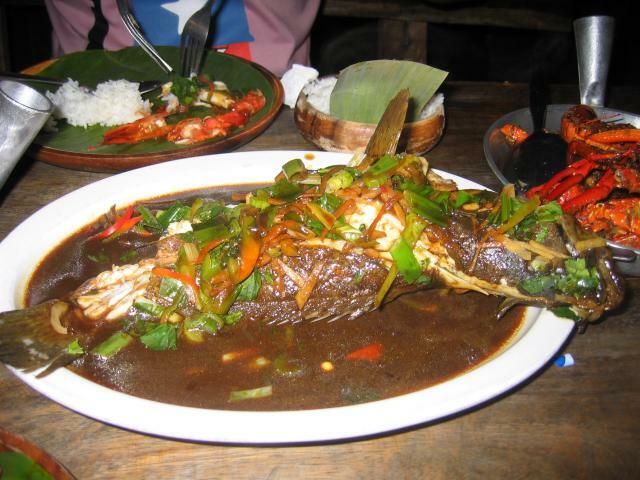 To this culture all the dishes in a meal is viewed for its role in relation to the rice. We even have a verb for when you eat unaccompanied by rice a dish that is normally eaten with rice. As you can expect, the word carries with it a tone of mild disapproval. In connection with PPPans’ calamansi, I believe it was Gray Kunz who introduced the use of calamansi to mainstream New York cuisine. He got his idea from a cooking stint in Hong Kong. I said mainstream NY because the Filipino karihan(s) below Port Authority have been using it long before that. In addition to calamansi and dayap, cooks in my town also use a wild and cheap (because its free) souring agent called kabuyaw. Green, the size of a small orange, thick rind and otherwise inedible but the juice offers a unique and exotic citrus flavour.